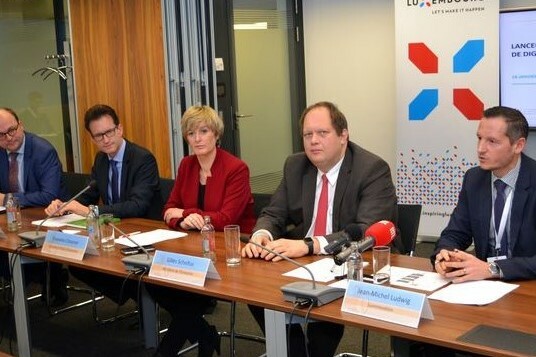 The Cluster partnered with the Council of Supply Chain Management Professionals Benelux (CSCMP) to assemble an international panel of speakers and invited Minister of Labour, Mr Nicolas Schmit to share the government’s view on the subject. 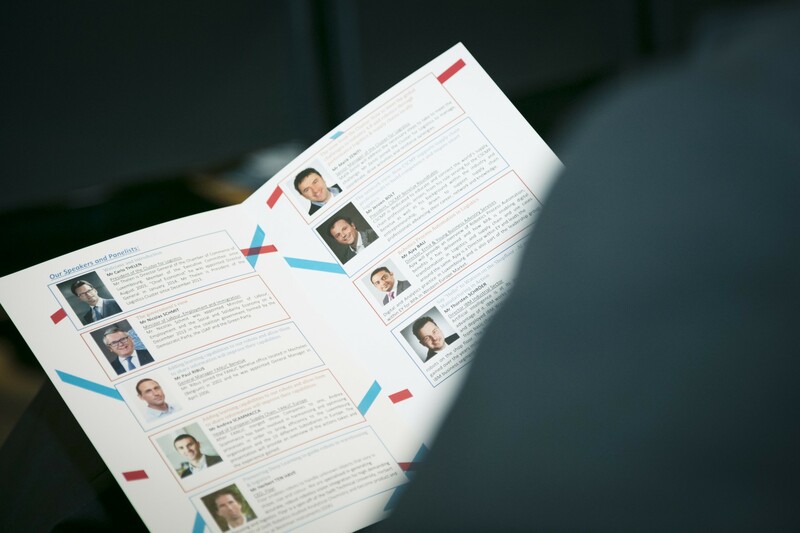 The Conference and networking lunch was made possible with the help of the Sponsors Kuehne + Nagel, EY Luxembourg, Amova as well as FANUC and with the support of the Chamber of Commerce and Digital for Industry (D4I). Artificial intelligence, robotics and Industry 4.0 are more than just buzzwords. These will impact logistics processes and services deeply and transform the way people work. 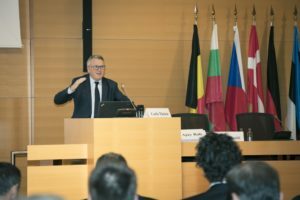 Minister Nicolas Schmit was delighted to see students from the Lycée des Garçons and students from the new Luxembourg Centre for Logistics and MIT Master in Logistics and Supply Chain Management Course as schools and universities have to prepare the next working generations to the challenges of tomorrow – to jobs we do not foresee yet. This will deeply affect the way people work and schools will have to teach children to adapt to changing conditions. “We have to be ready for the change and those who try to slow down change will be the losers” as the changes will have positive aspects. The Minister of Labour, Employment and Immigration does not believe that this technological revolution will be completely different than those in the past: “Not all jobs can be saved but we have to confront the transformation”. While some tasks will disappear, new ones will be created. In order to support this change, the ministry of Labour is developing a pilot project in the domain of re- und upskilling to encourage firms to anticipate technological change and confront the skills gaps which arise. “If we can show, both as public and private decision-makers that this technological transformation can be managed in an inclusive way, we will be able to tame some of the fears currently haunting the public debate,” said Mr Schmit. This transformation of work with humans and cooperative robots (or co-bots) can also help to generate better working conditions. For Carlo Thelen, Director general of the Chamber of Commerce and President of the Cluster for Logistics, the trend cannot be ignored. “The forecasted aging and decrease of population makes robotics and automatization a must!” Already some sectors suffer from a lack of workforce – having self-learning robots work hand in hand with employees can compensate employment mismatch and enhance productivity. Robotics and Artificial Intelligence are directly connected. Beyond the mere programming of actions, modern robots now see, learn and interact among each other and humans. 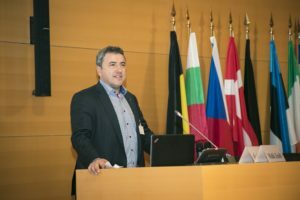 Paul Ribus, General Manager of FANUC Benelux presented the next steps in robotization: “First we gave them eyes to see, then we gave them brains to learn and finally we gave them a network to exchange their experience”. The fast learning aspect is key in modern robotics. Instead of following programmed actions, they are capable of learning from their mistakes and share their experience to learn even faster. 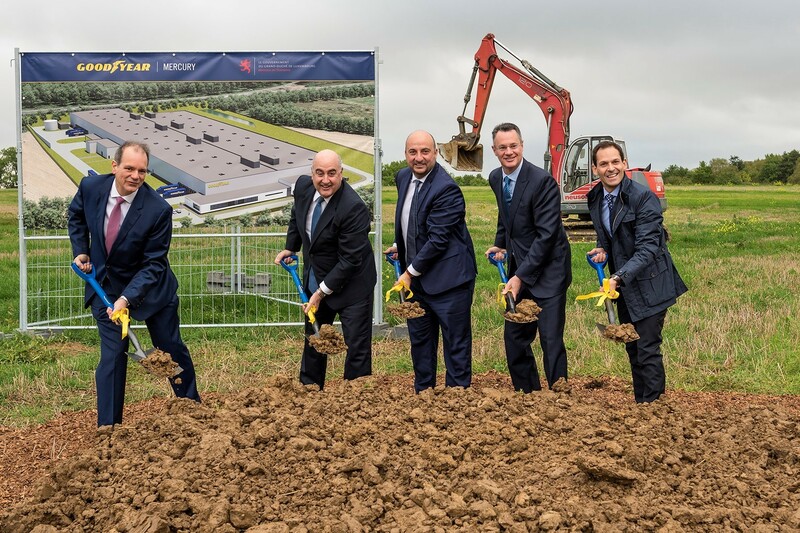 Andrea Scammacca, Head of European Supply Chain FANUC Europe gave an overview of the implementation of the FANUC Central Logistic Hub and Product Customization centre in Contern. In new warehouse of Kuehne + Nagel, the company prepares the robots for delivery to clients. AI is in everybody’s mind because everyone is afraid a competitor may be the first to implement new processes, says Thorsten Schröer, Director IBM Industrial Service. Mr Schröer gave an overview of IBM Watson, the company AI platform for businesses, which is capable of learning and spreading the knowledge among a network of robots. The robots now learn from their mistakes and improve processes. The fear that intelligent robots will replace humans exists for over 60 years now, says Thorsten Schröer. Until now the tools did not exist, but thanks to modern computing power, the pace has accelerated. The capacity of modern robots – which can carry, identify production or even jump like athletes may look like “Star Wars” but they are reality now. 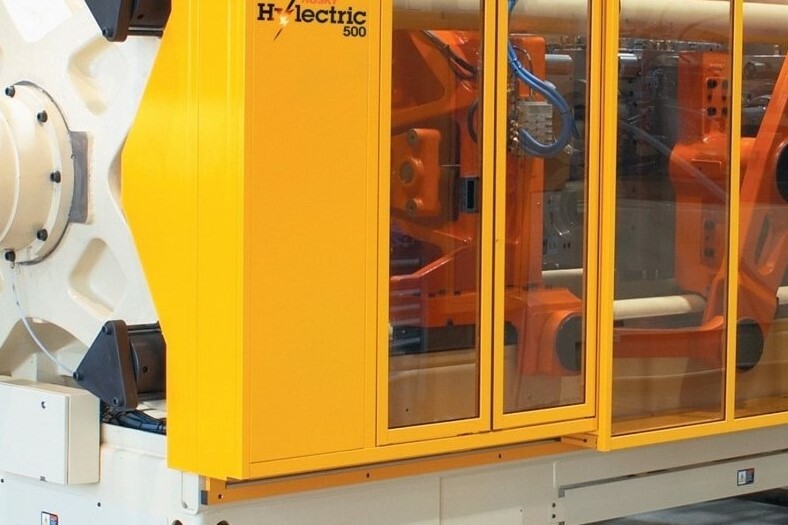 Processes like quality control can be transferred to robots with special sensors. Human eyes are not made to stare for hours to detect production mistakes, says Mr Schröer. Self-driving buses with IBM technology are already being tested in Berlin and Las Vegas. Their advantage compared to humans: they don’t get tired or do not text during driving. Robots are mastering “Deep Learning” to support humans in processes says Robert ten Have, CEO of Fizyr. The company is a previous winner of the Amazon Picking Challenge, and a pioneer in Deep Learning machine vision to use robots for order picking and parcel handling. Fizyr has applied deep learning to enable robots to cope with boxes, cylinders, bags, etc. Robots are able to pick and stack standardized things much faster than humans. Varied bodies however are more complicated. “Order picking and parcel handling is still done manually because until recently robots could not handle unknown parcels”, says Mr ten Have. By trial and error, artificial intelligence enables robots to learn how to pick irregular shapes. Specialized order picking applications will transform warehousing and postal services. Modern identification sensors enable a even better more regular quality control than humans can achieve over a long time. Software robots can free up time to work on value added services. A.I. doesn’t always involve a complicated implementation in the existing ICT infrastructure, according to Ajay Bali, Director Ernst & Young Advisory Services. Robotic Process Automation (RPA) creates a layer on top of the existing ICT framework. It works in the background, streamlining repetitive processes like data entry, leaving more time for employees to work on value adding activities. “It is like a virtual workforce but its use varies with activities and companies. And how you implement is very important”, warns Mr Bali. 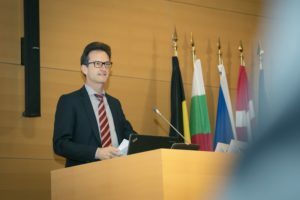 Human interaction should not be forgotten to survive this “tidal wave of technology”, says Jeroen Bolt, chairman of the Council of Supply Chain Management Professionals Benelux and partner of this conference. CSCMP is a US based network that connects 8,000 Supply Chain Specialists all over the world. The next German CSCMP roundtable in Munich on Nov 30th will give an in-depth overview of Blockchain Technology in Supply Chains. Tom Leys, Head of Logistics Engineering BeLux Kuehne + Nagel, joined the panel with the speakers to face the questions of the public. The panel acknowledged that robots will be able to support humans positively in many tasks. In regard of sustainability, automated driving or supply chain management should produce less CO2 emissions as computers will be more efficient than humans to optimize transportation. Considering shift work it might be possible to enhance work-life balance in warehouse management, said Mr Leys as an example. “Collaboration is key even with co-bots”, says the Cluster Manager Malik Zeniti who gave an overview of the Cluster’s activities. 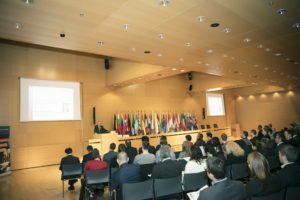 He invited companies to join the Supply Chain Day on April 19th 2018 organised in cooperation with the Bundesvereinigung Logistik (BVL). During this open-door day, logistics and industry companies can present their activities to the greater public.